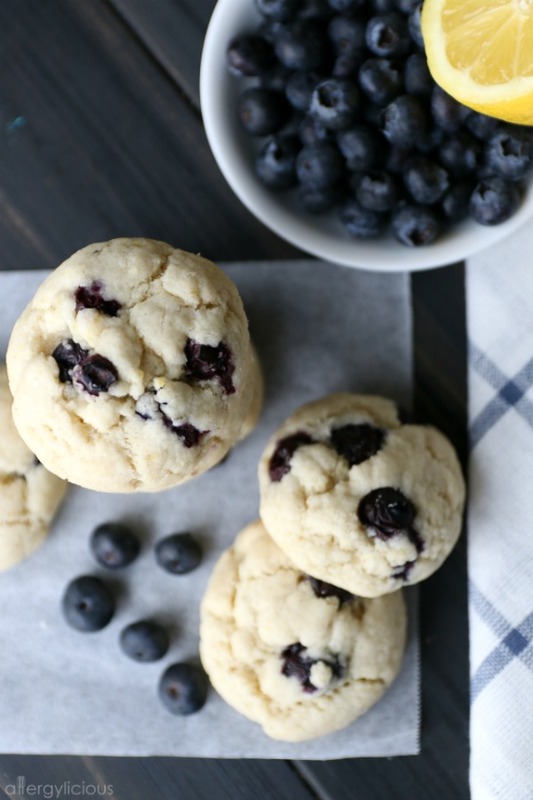 These light and refreshing Blueberry Lemon cookies are a springtime delight, infused with bright fresh lemon flavor, sweet blueberries and tangy cream cheese filling. 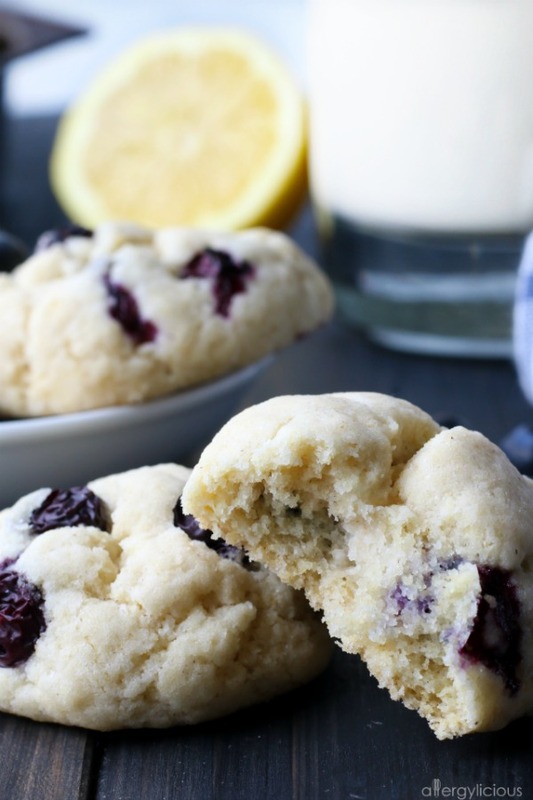 Blueberry Lemon Cookies are simply delightful, bursting with bright flavors and exactly what I needed! I am so done with this weather! One day it’s in the 80’s, the next day we’re under a freeze watch and somewhere in-between there’s a tornado warning. Yep, welcome to Oklahoma my friends. In all reality, I’ve grown to love living here but on days when it’s cold, rainy & windy, all I really want is to be somewhere warm and tropical and since that wasn’t happening, I decided to make these sunshine inspired cookies to cheer me up. 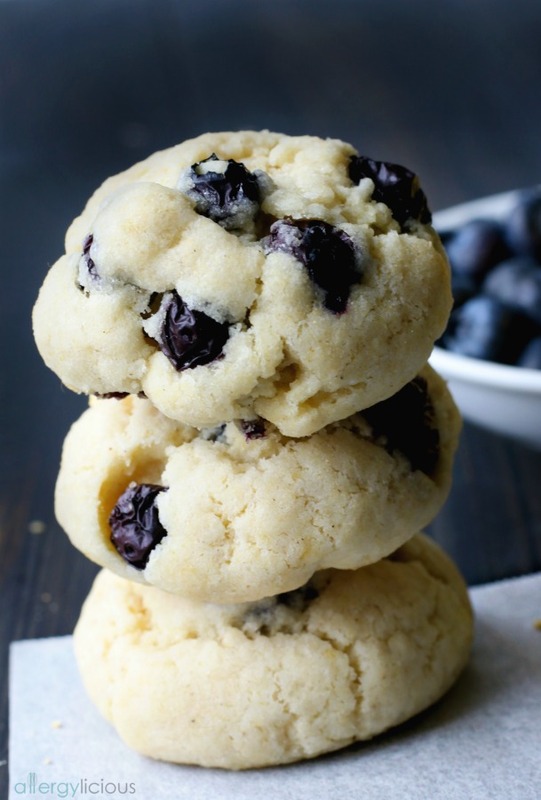 You need to make these blueberry lemon cookies at least once this spring or summer, especially while all the fresh blueberries are in season. It’s so bright and refreshing and it just screams happiness, even when the weather outside is yucky. 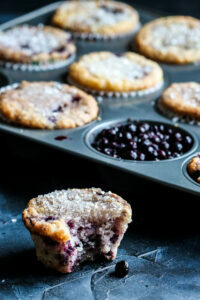 The cookies are so soft and moist, kind of like a lemony cookie-cake that’s loaded with sweet blueberries. And just to kick it up a notch, tucked away inside each cookie is a tangy bit of vegan cream cheese heaven which complements the sweetness perfectly. There’s just so much deliciousness tucked into every bite! And do you know what that means? It means there’s room for extra blueberries and lemons….YAY!!! 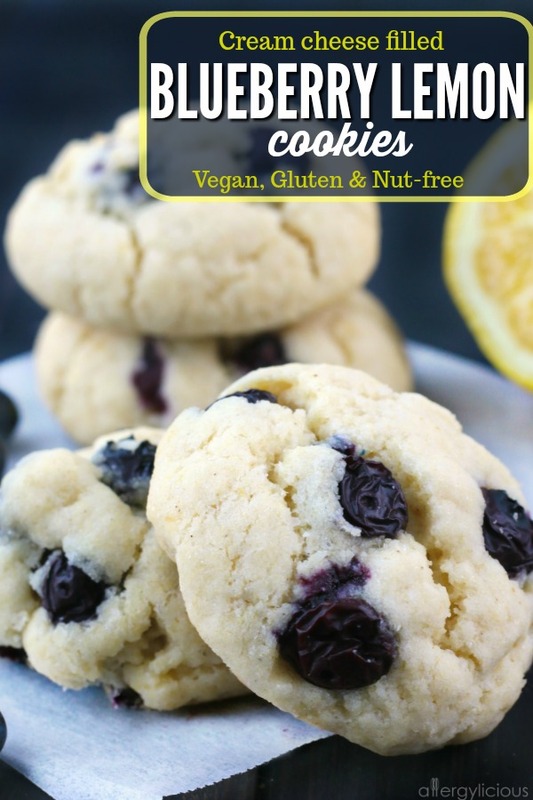 Try making these Blueberry Lemon Cookies next time you need a little sunshine in your life! Or even better, make these for someone special (Mother’s Day is around the corner!) and brighten up their day as well. More lemon-y recipes for you! 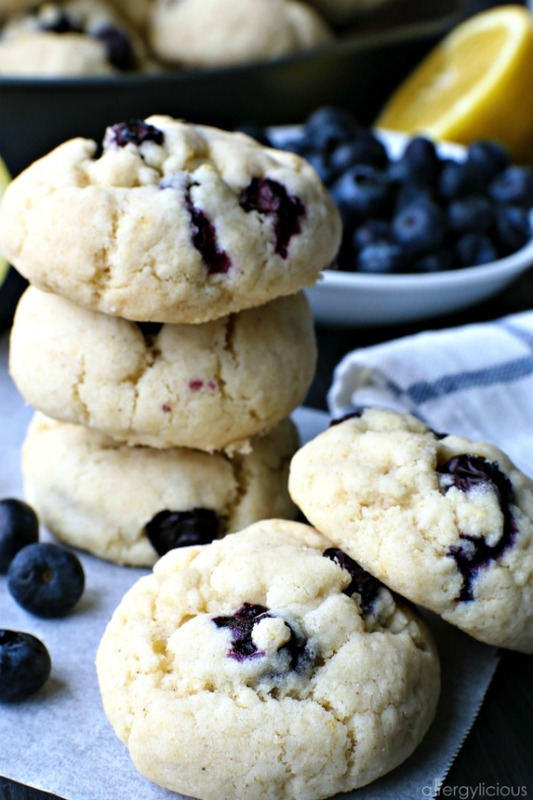 Lemon Blueberry Cookies with a cream cheese filling – these cream cheese filled cookies are bursting with fresh blueberries creating a delightfully soft cookie with bright citrus flavor of lemon. Delicious! Preheat oven to 350°. Line baking sheet with parchment paper and set aside. In a large mixer bowl, cream together vegan butter and sugar until light and fluffy. Add lemon zest, juice and egg replacer, scraping down the sides as needed. 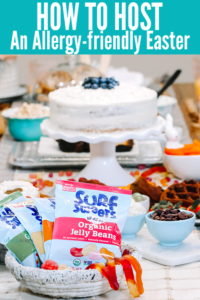 In a medium bowl, whisk together baking soda, baking powder, salt and flour then while the mixer is on low speed, add this dry mix to the wet ingredients. Carefully fold in blueberries. Refrigerate dough 15-20 minutes, so it’s easier to handle. Roll 1 heaping tablespoon of dough into a ball. If using vegan cream cheese, place 1 teaspoon of cream cheese in the center then fold dough edges back up to cover it, creating a ball again. Bake 10-14 minutes, or until edges are slightly brown. Transfer to cooling rack and refrigerate until ready to serve. **Can omit the cream cheese step and simply just bake as is. Sign up for the Allergylicious newsletter for a fresh serving of content delivered every week to your inbox! Grab a copy of my eBook, find me on Facebook, Twitter , Pinterest and if you give this recipe a try, let me know by leaving a comment and rating the recipe! It’s super helpful for us. And while you’re at it, take a picture and tag it #allergylicious on Instagram so we can see! We love seeing what you come up with. Of course Jasmin. I hope you get to try these soon. These look amazing! They also scream SPRING! That’s one of the reasons why I just love this recipe, especially when its cold and rainy outside (like today). 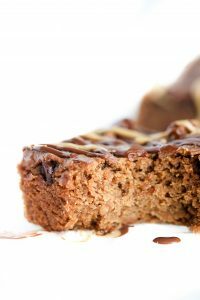 Yes Stephanie, flax egg also works great with this recipe. At least you’re getting some warm weather mixed in with those chilly days. Chicago has some 70 degree temps in the forecast for next week. I’m praying that doesn’t change, I’m so ready for warm breezes. Lemon and blueberry is one of my favorite combinations. I’ve made muffins with this combo, but never cookies. I can’t wait to try these, Nicole! They look delicious!! Springtime makes me want to make all the lemony things and these look lovely! Thanks Holly. I get in the mood for those foods as well. I have some Meyer lemons that need to be used. Thanks so much for sharing this recipe. I’m sure these will be a big hit with my family.